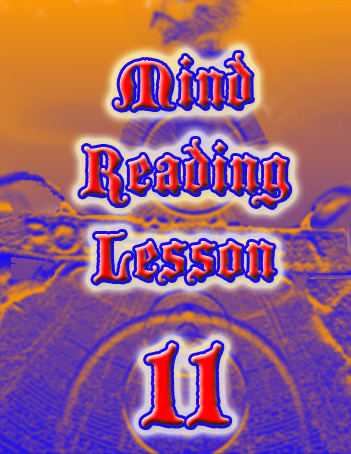 Today, when you order "Mind Reading Lesson 11 by Kenton Knepper", you'll instantly be emailed a Penguin Magic gift certificate. You can spend it on anything you like at Penguin, just like cash. Just complete your order as normal, and within seconds you'll get an email with your gift certificate. We are always excited when Kenton and the S.E.C.R.E.T. 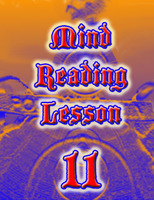 School release a new Mind Reading Lesson. We are especially thrilled with this one, as it gives a glimpse into the inner sanctum and teachings of the S.E.C.R.E.T. School, and teaches ploys by Kenton never revealed in any way previously. Some of the teachings in this Lesson were recently used again by Kenton to get on television and be interviewed as an expert on the workings of the mind and suggestion. You can do the same with what is in this Lesson. What really matters are the principles, novel methods and effects in this incredible Lesson 11. Here is a sample of what you will find in this Lesson. A very moving and unique way of performing Pseudo Psychometry that is straight from the "Dining With Wizards" show. Kenton reveals how he secretly Knows whose item is hidden in what bag, as well as the motivational ending that is sure to leave a lasting impression on any audience, large or small. This has always been a hit for Kenton. Turn an audience member into an instant Mind Reader although they are not sure how this happened! An envelope is sealed with items inside. The Mind Reader has the spectator sign the envelope on both sides, and the hold the sealed envelope up to their "third eye" to try to name what is inside. Oddly enough, the spectator does just this. An impartial audience member opens the envelope (no switches) and finds the spectator's impressions to be correct. The envelope can of course be examined and kept by the audience if desired. No pre-show of any kind. This is a very novel ploy. This has never been put into print by Kenton until now. It has stunned performers of all kinds, not to mention more typical audiences. Business cards are mixed by audience members. Some of the audience writes questions on their cards. The written cards are sandwiched in the middle of blank cards on both sides and sealed with a rubber band around them. The written cards really are unable to be read in the middle of the stack, and all the business cards are normal. Still the Mind Reader answers questions, names people who wrote the questions and so on. 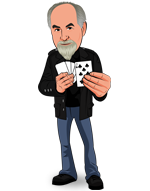 As if this is not enough, the performer "feels" which answer is where in the stack and removes each one sight unseen after intuiting the information on that card. In the finale all is covered with a cloth and held by an audience member and even under these conditions, the Mind Reading is repeated. The audience removes the banded cards, sees the written cards in the middle, and may take all the cards home as a souvenir. The banded cards may be isolated in a glass if you wish, to prove no sleight of hand is used. No one ahead, pre-show, stooges or any of the usual stuff. This all happens in real time with no special props, palming, or switches. Kenton teaches several of his impossible predictions never before revealed. An envelope is heavily taped on all sides by duct tape (for instance) and secured to a board.This board is then covered in wrapping paper, newspaper or whatever you wish, and the paper is taped securely all over the board. Before the show the paper on the outside of the prediction is signed by the audience, and remains in full view until the climax of the show. For the climax the paper is torn off the board to reveal the envelope securely taped to the board. Very slowly and methodically the envelope is removed from the board and all the tape. The envelope is sealed on the back with even more tape and an audience member opens this to remove the prediction inside. The prediction names daily events, and things that happened during the show itself. NO envelope switches and the board may be in view at all times. There are other versions included and detailed here in full for the first time ever. Many of these items could have been sold separately for the price of this Lesson alone. But there is much more to this important Lesson. The power of thought and suggestion take center stage to prove real Mind Power that cannot be denied. This is so realistic well-meaning people fool themselves with these principles constantly and have no idea they are doing so. Learn about the historical meaning behind the mysterious term "mentalism", Kenton's take on the subconscious and how to apply it to Mind Reading and Mind Power demonstrations, how to use actual muscle testing as a way to read minds, how to fool audience members into thinking you are using legitimate tests on them, while actually covertly influencing them, etc. This section includes, The Strong Arm Book Test, The Cynic Suggestion, Kenton's Power Band, Helping By Mental Power, Subconscious Suggestion as Mind Reading... and that's only part of it. Life coaches, hypnotists, suggestionists, motivators and anyone who cares about improving themselves or others will use this information and effects in life-changing ways. Don't get us wrong. This is all accomplished through the performance of Mind Reading and Mind Power demonstrations that seem impossible to audiences everywhere. This is SO real, many people will think your Mind Reading is real. John Charles Robinson's "iBall" complete with Kenton's original X Ball with additional nuances, and applications. Kenton's Electric Impulses, Double-Crossed Peek, Brazen Book Moves, Out The Window, and more. If this seems like we are over hyping this, we are actually understating what is in this important Lesson 11.